The address book is accessible by pressing “ADDRESS BOOK”. 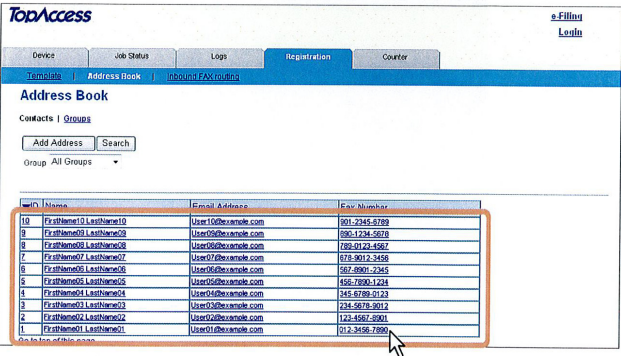 Entries in the address book are used to specify e-mail addresses and/or fax numbers for fax transmission and Scan to E-mail. You can register up to 3000 contacts, which can contain a fax number, an e-mail address, or both in each contact. Press each button on the touch panel to enter the contact information. (First name, last name, email address and fax number). Press “OK” to register the contact. Click “Add Address” and add a new contact. Enter the following items to specify the contact property. (First name, last name, email address and fax number.